Sea levels fell during the Little Ice Age. As I have often pointed out, there was a massive expansion of glaciers worldwide, so there should really be no surprise about this. The current rate of rise is little different to the period between 1920 and 1950, a fact that even the IPCC have accepted. There is therefore no evidence of the acceleration often claimed. Any human fingerprint on sea level rise is debatable, but probably small in any event, given the natural forces in play since the mid 19thC. 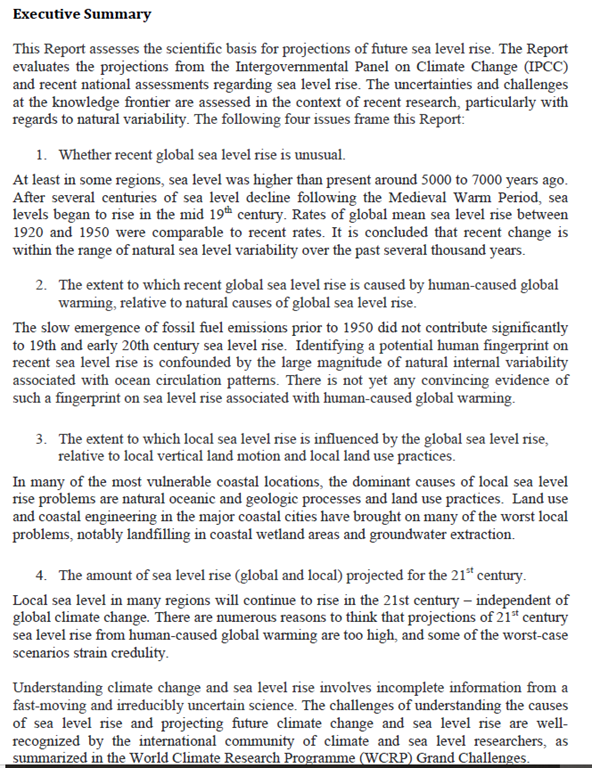 Future projections of much greater sea level rise have no basis, and strain credulity. 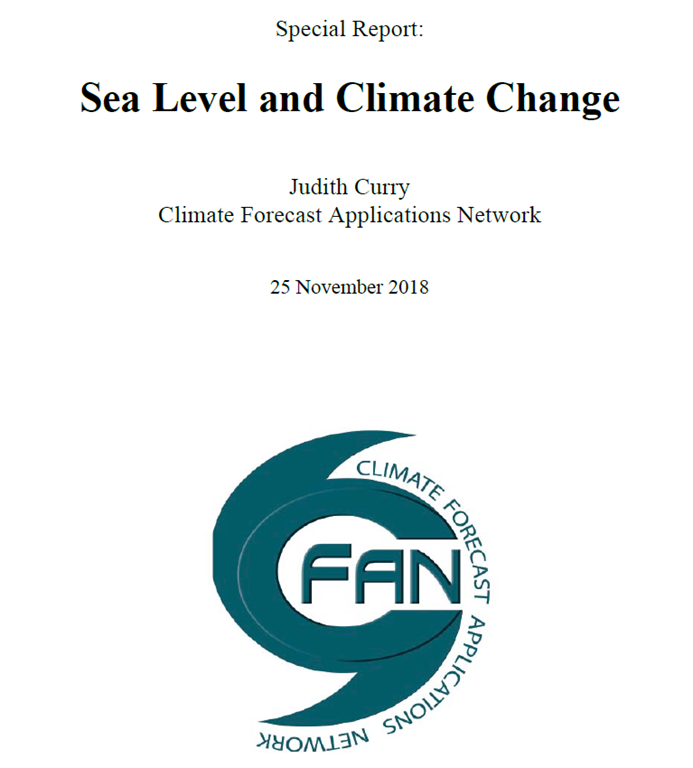 I have been making similar points for a while, so it is good to see Judith Curry adding her scientific weight to the case. That’s precisely what we’ve all been saying ever since the words ‘Sea Level rises -catastrophic’ were first used! Some sense at last. BBC to pick this up and run with it? NOPE! 35 years at least, of progress squandered by climate alarmists, in the face of a greening planet. Translation of the first sentence: The IPCC is not interested in telling the truth. Not sure that is correct. In some part of the Florida coastline, I think I heard a local politician or Civil Engineer say this year or last, that the weight of new builds was actually causing the land to sink into the sea. I hope I have remembered that correctly. His interview was broadcast on BBC R4 when Florida experienced some recent flooding but what he said has obviously disappeared into the BBC’s and environmental activists memory holes. The same is true of parts of Thames-side London, a friend who is a Civil Engineer presented a learned paper on the subject. Certainly for eastern England, humankind cannot be blamed for tectonic plate shift. That’s not a “human fingerprint on sea-level rise”, friend, that’s a damn’ great human footprint causing the land to sink. The net effect on Floridans might be much the same but please let’s call it like it is. The rest of us are not responsible for American stubbornness and short-sightedness. Judith’s paper is a breath of fresh air though I doubt it will gain any traction where it matters. Too much invested in the lie to stop now. It is interesting how the ‘Sea Level Rise’ – thing has grown in permanence over this century despite the obvious contradiction that if temperature rises, then so do evaporation rates, etc.. The proponents always point to low-lying islands, mostly in Oceana, as being the innocent victims of sea level rise. What they never, ever point out is that new building is going on apace at watersides around the rest of the globe with new luxury homes being built for wealthy people. Often to facilitate those new waterside properties, the poor are cleared away, to make for the wealthy. Fortaleza in Brazil is a good example early this century, Lagos in Nigeria a few years earlier. I don’t quibble about Judith Curry or her report, just that a section of humankind is not being honest. As far as eastern England is concerned, way back when I was training back in the late 1950’s we were told that the UK was tilting about the Braintree axis – the east was sinking and the west rising. This would account for apparent sea-level rises in this part of the world and pre-dated any climate change propaganda. This can also be said about the any climate-related metric, including global mean surface temperatures.